Join AirUtopia and discover what makes Osaka a true aviation paradise for both the passionate enthusiast and the casual observer. The dual airport system of Itami and Kansai offers extensive viewing facilities that are simply some of the best in the world. When you combine this intimacy with the historic first arrival of the Airbus A380 to Kansai, you have a truly inspiring Japanese aviation adventure! 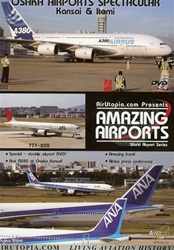 Special - double airport DVD! First A380 in Osaka Kansai!